More than 400 people gathered for the dedication of Northwestern College’s new Jack and Mary DeWitt Family Science Center on Friday afternoon, Sept. 28. 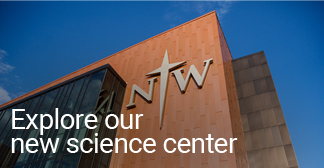 “This facility is ultimately about investing in the lives of students and equipping them for God’s purposes,” said Dr. Bryan Den Hartog ’81, a St. Paul, Minn., orthopedic surgeon who is on Northwestern’s Board of Trustees and chaired the Discover Campaign Committee. The DeWitt Family Science Center is named in honor of Jack and Mary DeWitt of Holland, Mich., who contributed the $6 million lead gift for the building—the largest single gift in Northwestern’s history. Jack DeWitt died June 22, 2018, at the age of 75 after a battle with brain cancer. The science center was part of a $30 million Discover Campaign that also included funds for the building’s maintenance, science scholarships, and undergraduate research fellowships.